The Port Credit “A” Gold Rep Hockey is part of the Mississauga Hockey League associations. Our teams compete with the other Mississauga association teams in all age groups starting at Minor Atom (9 years old) up to Midget Senior. There will be an additional fee of $65 for players who are non-residents of Mississauga. 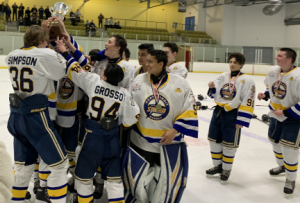 ‘A’ and Gold players that have signed a registration card for the 2019 – 20 season, must register online between April 30th and May 12th. Tryouts are in late April and the season gets underway in the middle of September. There are 2 games played during the week, and most teams have two practices per week. Games usually start between 6 and 7PM for the Atom division, and run progressively later in the evening for the older age groups. The Mississauga Hockey League usually has the entire season game schedule posted by the start of the season. All games are played within Mississauga.